We read with interest the article written by Creuzot-Garcher and colleagues that was published in the June 2018 issue of your journal. 1 The authors retrospectively reviewed billings codes from a national database in France from January 2004 to December 2014 to examine acute postoperative endophthalmitis (POE) rates. They reported an incidence of acute POE in stand-alone phacoemulsification of 0.102% over this 11-year period. In contrast, combined surgery in which phacoemulsification was performed with another intraocular procedure had an overall higher incidence of 0.149%. The incidence of acute POE in combined phacoemulsification and glaucoma surgery, corneal surgery, and vitreoretinal surgery was found to be 0.089%, 0.142%, and 0.223% respectively. As Creuzot-Garcher and colleagues mention, many phakic patients who undergo either glaucoma surgery, corneal surgery, or vitreoretinal surgery, are elderly and likely will require cataract extraction at some point.1 In addition, it is well established that these surgeries promote cataract formation in phakic eyes, and therefore patients who do not undergo combination surgery will likely require stand-alone cataract surgery in the future. (i)	In the scenario where glaucoma surgery is performed and, at a separate date cataract surgery is done, the total risk of developing acute POE would be 0.171%. This is higher than the risk of 0.089% in combined surgery quoted in the article. (ii)	In the scenario where corneal surgery is performed and, at a separate date cataract surgery is done, the total risk of developing acute POE would be 0.236%. This is higher than the risk of 0.142% in combined surgery quoted in the article. (iii)	In the scenario where vitreoretinal surgery is performed and, at a separate date cataract surgery is done, the total risk of developing acute POE would be 0.292%. This is higher than the risk of 0.223% in combined surgery. Hence, while combined surgery may be associated with a higher incidence of acute POE as compared to a stand-alone procedure, multiple surgeries on the same eye but performed at different sittings may yield an overall higher risk. This information should be taken into consideration when planning surgery in phakic eyes. 1. Creuzot-Garcher CP, Mariet AS, Benzenine E, Daien V, Korobelnik JF, Bron AM, Quantin C. Is combined cataract surgery associated with acute postoperative endophthalmitis? A nationwide study from 2005 to 2014. Br J Ophthalmol. 2018 Jun 20. We have read with great interest the e-letter from Karakucuk et al. published in BJO responding to our paper titled ‘Acute retinal toxicity associated with a mixture of perfluorooctane and perfluorohexyloctane: Failure of another indirect cytotoxicity analysis ’ and we appreciate their positive appreciation of our research work. We consider extraordinarily important that they have reported four more cases in their country, thus, supporting that acute toxicity cases were not a Spanish problem as has been stated by some retinologist at an European congress (Barcelona, September 2017). We believe that this letter should encourage other colleagues from other countries from all over the world to report cases that certainly exist, according to non-official information from several companies. We completely agree that the ISO (the International Organization for Standardization) guidelines to determine the in vitro cytotoxicity of intraocular medical devices should be immediately changed. These guidelines should adopt direct cytotoxicity methods to be performed with finished, sterilized, and ready for release products. The analytical method utilized should include cells or tissues close to those of the retina to guarantee specific sensitivity and should be scientifically validated. We support the suggestion of increasing chemical research, because some companies are promoting chemical tests, as a “safety guarantee”, whose scientific validity and their direct correlation with biological tests has not yet been established. As you mentioned the presence of variable concentrations of non-fully fluorinate compounds are undesirable, but these compounds have not been related to acute toxic pictures such as those mentioned in our paper, and probably in your patients, although they could be the bases of variable intraocular inflammatory responses, that prevent the use of PFO as a long-term endotamponade agent. We read with interest the masterly review of the neuro-ophthalmology of Behcet’s disease by Alghamdi et al (1). One small aspect we question. The authors state that in their patients with papilledema: “The diagnosis of CVT was documented in all patients by cerebral angiography and MRI showing partial or total lack of filling of at least one dural sinus and an elevated CSF opening pressure (>25 mm Hg) on lumbar puncture.” We have recently reported 8 BD patients with pseudotumor cerebri who did not have cerebral venous thrombosis (CVT) on MRI or MRV (2). Partial or total lack of filling of one venous sinus does not constitute the pathophysiological basis for intracranial hypertension; either the sagittal sinus must be occluded, or if only one transverse sinus is occluded then the other needs to be stenosed (3). It would be interesting to know what a review of their patient’s images by a neuro-radiologist would reveal. 1: Alghamdi A, Bodaghi B, Comarmond C, Desbois AC, Domont F, Wechsler B, Depaz R, Le Hoang P, Cacoub P, Touitou V, Saadoun D. Neuro-ophthalmological manifestations of Behçet's disease. Br J Ophthalmol. 2018 Apr 26. pii: bjophthalmol-2017-311334. doi: 10.1136/bjophthalmol-2017-311334. 2: Akdal G, Yaman A, Men S, Çelebisoy N, Toydemir HE, Bajin MS, Akman-Demir G. Pseudotumor cerebri syndrome without cerebral venous sinus thrombosis in Behçet's disease. J Neurol Sci. 2017;383:99-100. 3: Halmagyi GM, Ahmed RM, Johnston IH. The Pseudotumor Cerebri Syndrome: A Unifying Pathophysiological Concept for Patients with Isolated Intracranial Hypertension with Neither Mass Lesion Nor Ventriculomegaly. Neuroophthalmology. 2014;38:249-253. We read the article ‘Acute retinal toxicity associated with a mixture of perfluorooctane and perfluorohexyloctane: Failure of another indirect cytotoxicity analysis ’ by Coco et al. with great interest. In this study, the authors reported on ocular toxicity due to perfluorooctane (PFO). They advised that the protocols used to determine the cytotoxicity of intraocular medical devices (which have been approved by the Organisation for the Standardisation of International Standards based on indirect methods) should be revised to ensure safety. We congratulate Coco et al.1 for their report because we believe that it has the potential to be a significant contribut or to the literature on this topic. As is commonly known, PFO is saturated with PFO liquids, which have highly stable carbon-fluorine bonds that consequently make them inert. PFO has highly specific gravity, low viscosity, optical clarity immiscibility in water and interface tension towards water. It is regularly used in vitreoretinal surgery for complex retinal detachment repair because it displaces subretinal fluid and blood anteriorly, unfolds the retina in giant retinal tear cases and provides counter traction and retinal stabilisation during membrane peeling in eyes with proliferative vitreoretinopathy. [2,3] These properties make PFO useful for intraocular surgery. However, some limitations exist regarding PFO use as a long- term tamponade such as amaurosis, a lack of light perception, optic nerve atrophy, acute retinal necrosis and retinal vascular occlusion (both arterial and/or venous) with disseminated haemorrhages. Notably, there are controversial results regarding PFO toxicity in the literature. [3-9] The present study was one of the few reports to discuss ocular toxicity due to PFO in the last few years. Using the current study by Coco et al.1 as a foundation, we would like to share our findings regarding the ocular toxicity of PFO. In our clinic, four patients underwent uneventful vitreoretinal surgery with PFO on the same day by two experienced surgeons (BB, SG). Each patient presented with vitritis, hypopyon and acute retinal toxicity, with no increases seen in either postoperative increased intraocular pressure or pain. Figure 1 (https://i.hizliresim.com/6NQWR0.jpg) shows macular atrophy due to PFO toxicity. Ocular toxicity may be either mechanical or chemical due to inhibition of and/or changes to tissue functionality and/or rearrangement of tissue parts and inflammatory reactions and/or immune reactions that result in function loss. In the past, intraocular injections of aminoglycoside caused occlusive vascular changes, which were attributed to the pH of the antibiotic. The mechanism of PFO ocular toxicity may be similar. In addition, concentration and contact time may lead to toxicity. For instance, in 2013, some cases of acute blindness due to PFO were reported by Chile’s Health Authorities, while four cases were reported in Spain to the Agency of Medicines and Medical Devices. The problems were attributed to careless manipulation of the Turkish product ; variable concentrations of perfluorodecalin were found in the octane, after which the product was withdrawn. Unfortunately, scientific reports have yet to clarify the causes of acute blindness. These results may help clinicians choose a short-term ocular tamponade when performing a vitrectomy. In addition, when faced with severe early postoperative intraocular inflammation, such as either vitritis or hypopyon, they should use PFO with care due to the possibility of toxicity and consider early systemic steroid treatment. In conclusion, more chemical research is needed to clarify the acute ocular toxicity of PFO to ensure the safety of human patients. Additionally, immediate updates to both the European and Organisation for the Standardisation of International Standards guidelines for the biological evaluation of ophthalmic devices are needed. 1. Coco RM, Srivastava GK, Andrés-Iglesias C, et al. Acute retinal toxicity associated with a mixture of perfluorooctane and perfluorohexyloctane: Failure of another indirect cytotoxicity analysis British Journal of Ophthalmology Published Online First: 29 March 2018. doi: 10.1136/bjophthalmol-2017-311471. 2. Loewenstein A, Humayun MS, de Juan E Jr, et al. Perfluoroperhydrophenanthrene versus perfluoro-n-octane in vitreoretinal surgery. Ophthalmology. 2000;107:1078–1082. 3. Abboud EB, Al-Falah M. Nine Years of Retained Perfluoro-n-octane in the Anterior Chamber after Retinal Detachment Repair with No Signs of Ocular Toxicity. Middle East African Journal of Ophthalmology. 2014;21(3):279-282. doi:10.4103/0974-9233.134697. 4. Stefano Zenoni, Mario R Romano, Sonia Palmieri, Natalia Comi, Edoardo Fiorentini, Piero Fontana. Ocular tolerance and efficacy of short-term tamponade with double filling of polydimethyloxane and perfluoro-n-octane. Clinical Ophthalmology 2011:5 443–449. 5. Zeana D, Becker J, Kuckelkorn R, Kirchhof B. Perfluorohexyloctane as a long-term vitreous tamponade in the experimental animal. Experimental perfluorohexyloctane substitution. Int Ophthalmol. 1999;23(1):17-24. 6. Chang S, Sparrow JR, Iwamoto T, Gershbein A, Ross R, Ortiz R. Experimental studies of tolerance to intravitreal perfluoro-n-octane liquid. Retina. 1991;11(4):367-74. PMID: 1813951. 7. Alharbi SS, Asiri MS. Reversible Corneal Toxicity of Retained Intracameral Perfluoro-n-octane. Middle East African Journal of Ophthalmology. 2016;23(3):277-279. doi:10.4103/0974-9233.186160. 8. Pastor JC, Coco RM, Fernandez-Bueno I, Alonso-Alonso ML, Medina J, Sanz-Arranz A, Rull F, Gayoso MJ, Dueñas A, Garcia-Gutierrez MT, Gonzalez-Buendia L, Delgado-Tirado S, Abecia E, Ruiz-Miguel M, Serrano MA, Ruiz-Moreno JM, Srivastava GK. 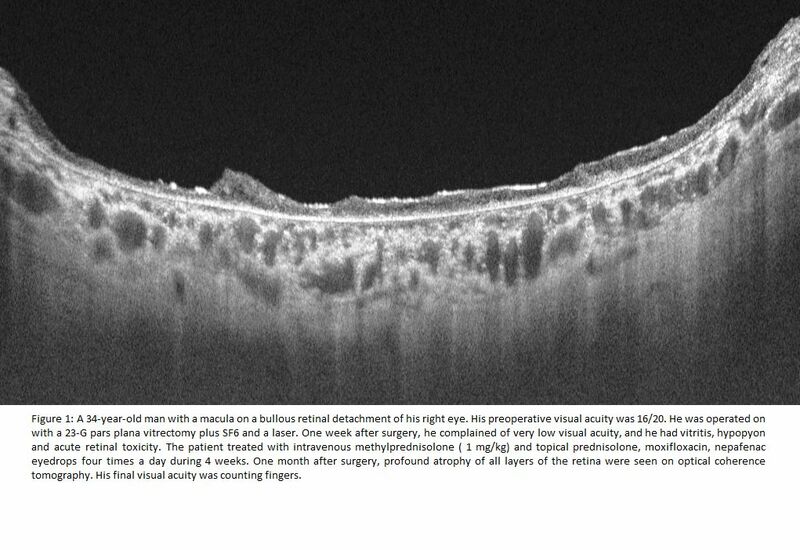 Acute retinal damage after using a toxic perfuoro-octane for vitreo-retinal surgery. Retina. 2017 Jun;37(6):1140-1151. doi: 10.1097/IAE.0000000000001680. 9. Pradeep S, Chhablani JK, Patel B, Rani P. Delayed inflammation associated with retained perfluorocarbon liquid. Indian J Ophthalmol. 2011 Sep-Oct;59(5):396-8. doi: 10.4103/0301-4738.83623. PMID: 21836352. 10. Waltz K, Margo CE. Intraocular gentamicin toxicity. Arch Ophthalmol 1991;109:911. Figure 1: A 34-year-old man with a macula on a bullous retinal detachment of his right eye. His preoperative visual acuity was 16/20. He was operated on with a 23-G pars plana vitrectomy plus SF6 and a laser. One week after surgery, he complained of very low visual acuity, and he had vitritis, hypopyon and acute retinal toxicity. The patient treated with intravenous methylprednisolone ( 1 mg/kg) and topical prednisolone, moxifloxacin, nepafenac eyedrops four times a day during 4 weeks. One month after surgery, profound atrophy of all layers of the retina were seen on optical coherence tomography. His final visual acuity was counting fingers. I read with great interest the article by Bae and collegues.1 In their retrospective study, the authors concluded that the presence of atypical epiretinal tissue (AET) in a full-thickness macular hole (FTMH) was related to poorer anatomical success and less visual recovery after surgery. I agree with the authors on the association of their OCT findings with the visual prognosis. I also agree with them that it is important to identify a good indicator of visual prognosis based on OCT findings. However, there are many confounders to be addressed in this study. For example, preoperative MH size with OCT has been known as a prognostic factor for postoperative visual outcome and anatomical success rate of MH surgery.2,3 A previous study also demonstrated that ERM prevalence increased with severity and size of the FTMH.4 In addition, preoperative visual acuity or preoperative photoreceptor integrity also seems to correlate with visual prognosis. Thus, their results should be supported by appropriate statistical analysis, that is, multivariate regression analyses. I hope that the authors will comment on the results of multivariate regression analyses to identify the most significant factor to predict visual prognosis after MH surgery. 2. Ullrich S, Haritoglou C, Gass C, et al. Macular hole size as a prognostic factor in macular hole surgery. Br J Ophthalmol 2002;86:390-3. 3. Duker JS, Kaiser PK, Binder S, et al. The International Vitreomacular Traction Study Group classification of vitreomacular adhesion, traction, and macular hole. Ophthalmology 2013;120:2611-9. 4. Cheng L, Freeman WR, Ozerdem U, et al. Prevalence, correlates, and natural history of epiretinal membranes surrounding idiopathic macular holes. Vitrectomy for Macular Hole Study Group. Ophthalmology 2000;107:853-9. We read with interest the paper by Gaier et al.1 The collection of 5 eyes affected by acute A-AION and analyzed with OCT-A is remarkable, due to the rare disease presentation. The main finding of the paper was that during the acute phase of A-AION, diffusely dilated superficial peripapillary capillaries were detectable on OCT-A. Interestingly, peripapillary capillary dilatation was also noted in the fellow eye. Unfortunately, the figures presented by the authors are too small to allow the reader to qualitatively appreciate the capillaries dilatation. More detailed images and a quantitative vessels analysis would have helped to document the microvascular changes. Moreover, the authors stated that OCT-A laminar analysis did not highlight the choroidal/choriocapillaris perfusion defects seen on FA. However, a recent study3 showed a tight correspondence between the choroidal perfusion defects visible on FA (and even better on indocyanine green angiography) and on OCT-A at the level of the choriocapillary in a single case of acute A-AION. The choroidal defects noted on FA by Gaier et al.1 were slightly distant from optic disc border and they did not fit inside the small scan area of the OCT-A exam. Larger OCT-A scan size could help to highlight choriocapillaris perfusion defect in those cases. 2 Jia Y, Simonett JM, Wang J1, et al. Wide-Field OCT Angiography Investigation of the Relationship Between Radial Peripapillary Capillary Plexus Density and Nerve Fiber Layer Thickness. Invest Ophthalmol Vis Sci. 2017;58:5188-5194. 3Balducci N, Morara M, Veronese C, et al. Optical coherence tomography angiography in acute arteritic and non-arteritic anterior ischemic optic neuropathy. Graefes Arch Clin Exp Ophthalmol 2017;255:2255-2261. I was most interested to read the review by Nazarali and co-authors to mark the centenary of the description of the exfoliation syndrome, XFS(1) sometimes called the pseudo-exfoliation syndrome (2). It is always interesting to see how our understanding increases incrementally with time and reviews such as these are important in helping shape further investigations. The linkage of environmental factors and XFS is important and as they say not well understood. Nazarali and co-authors might like to reflect on the findings in Australian Aboriginal people (3). Aboriginal people were found to have very high rates of XFS, being present in 16% of those aged 60 and above. The presence of XFS was related to total global radiation exposure and occupation. Most interestingly, XFS was not associated with high intraocular pressure or glaucoma. Surely this is an area where more research is required. We were interested to see Roberts, et. al study  which explored whether a hub-and-spoke model using a femtosecond laser (FL) could increase the efficiency and reduce the cost of cataract surgery. Although the model was not cost-effective when compared to conventional phacoemulsification surgery, more efficient models should continue to be assessed. The Aravind Eye Care system uses an alternative hub-and-spoke model. Instead of separate operating theatres (OTs), the physician alternates between two beds in a single OT. This model, and the safe reuse of surgical supplies, results in phacoemulsification cataract surgery with excellent outcomes at 1/20th the cost and carbon emissions [2-4]. Roberts, et. al recommend that the ideal number of OTs to maximise the utility of an FL in a hub-and-spoke model is four. However, they were not able to evaluate the effect of adding additional OTs to their model as they only had two OTs. We suggest that adopting the Aravind model to jump to the 1:4 model without further building work could significantly alter this paper’s conclusions. We would be interested to know if elements of the Aravind model, two beds one theatre, could be adopted in their setting. On average patients receiving FLACS spent 5.85±1.99 mins in the laser suite (LS), implying a potential throughput of between 8 and 15 cases per hour. We are interested to know the authors views on the the limits of the FL and what impact the adoption of bilateral sequential cataract surgery might have on their cost estimates,  assumptions about throughput and the potential viability of more intensive 1:6 or 1:8 models. Finally, maintaining training standards while improving efficiency is a challenge and we would be interested in the authors views on how training is best catered for within their different hub and spoke models. We would like to add some data to this interesting discussion about the impact of ophthalmic artery chemosurgery or intra-arterial chemotherapy (OAC) in the occurrence of secondary malignancies in children with retinoblastoma with germline mutations of the Rb1 gene. The discussion about the incidence of secondary leukemia is an important one. Secondary leukemias usually present early in the patient follow-up, usually around 2-3 years. Systemic chemotherapy has been implicated in their occurrence since, they were not identified as a common secondary malignancy in patients with retinoblastoma not receiving chemotherapy1. Their occurrence is low1, but as the case Dr Meadows and Lahey report are usually refractory to treatment and usually fatal. In our series of patients treated with systemic chemoreduction for conservative therapy from Argentina, secondary AML was the most common fatal secondary malignancy with a total of 2 out of 129 cases. We had a third case in a child receiving chemotherapy for extraocular disease, similarly to Dr Meadows and Lahey’s case2. In our current, yet unpublished results with ophthalmic artery chemosurgery, we had no case of secondary AML , in 71 consecutive cases with bilateral retinoblastoma treated with OAC with a median follow-up of 42 months. Secondary AML has been widely reported as a complication of systemic chemotherapy in pediatric oncology patients 3 including those receiving epipodophillotoxins 4and also alkylating agents5. Cumulative systemic exposure to chemotherapy , along with genetic predisposition, seem to play a major role in its occurrence4, 5. In the case, Dr Meadows and Lahey report, the doses of alkylating agents received for the treatment with high dose chemotherapy should have been significantly higher than those from intra-arterial melphalan. We have estimated from our pharmacokinetic study of melphalan in patients receiving OAC for the treatment of retinoblastoma that systemic exposure is at least 10 times lower compared to systemic doses which are regularly used for preparation for high dose therapy and stem cell rescue as Dr Meadows and Lahey’s case6. Additionally, since OAC regimens do not include epipodophillotoxins, secondary leukemias caused by exposure to these drugs are eliminated. So, while it is likely that the significantly lower systemic exposure to chemotherapy obtained by OAC6 might add some risk of secondary leukemia to these predisposed patients, date presented up to the present time suggest that, compared to systemic chemotherapy a lower incidence of secondary leukemia or in fact no cases in children only treated with OAC are seen. The discussion about the potential prevention of metastatic dissemination and the role of systemic versus OAC in it is also an open one. While it is likely that lower systemic chemotherapy levels achieved with OAC might provide a lower protection against systemic dissemination, on the other hand OAC provides a significantly higher exposure to chemotherapy in the optic nerve, which is a major source of dissemination for retinoblastoma to the CNS. Dissemination to this critical compartment is usually fatal7. If we apply the rationale proposed by Dr Lahey and Meadows of thinking that a higher exposure to chemotherapy would be more effective in preventing metastasis in minimally disseminated disease, OAC would be more effective in preventing dissemination through the optic nerve compared to systemic chemotherapy. 1. Gombos DS, Hungerford J, Abramson DH, et al. Secondary acute myelogenous leukemia in patients with retinoblastoma: is chemotherapy a factor? Ophthalmology. 2007;114: 1378-1383. 2. Chantada GL, Fandino AC, Raslawski EC, et al. Experience with chemoreduction and focal therapy for intraocular retinoblastoma in a developing country. Pediatr Blood Cancer. 2005;44: 455-460. 3. Hijiya N, Ness KK, Ribeiro RC, Hudson MM. Acute leukemia as a secondary malignancy in children and adolescents: current findings and issues. Cancer. 2009;115: 23-35. 4. Pui CH, Ribeiro RC, Hancock ML, et al. Acute myeloid leukemia in children treated with epipodophyllotoxins for acute lymphoblastic leukemia. N Engl J Med. 1991;325: 1682-1687. 5. Davies SM. Therapy-related leukemia associated with alkylating agents. Med Pediatr Oncol. 2001;36: 536-540. 6. Schaiquevich P, Buitrago E, Taich P, et al. Pharmacokinetic analysis of melphalan after superselective ophthalmic artery infusion in preclinical models and retinoblastoma patients. Invest Ophthalmol Vis Sci. 2012;53: 4205-4212. 7. Taich P, Requejo F, Asprea M, et al. Topotecan Delivery to the Optic Nerve after Ophthalmic Artery Chemosurgery. PLoS One. 2016;11: e0151343. We have read with interest the paper by Klimova et al. Some statements in the paper are confusing and may even mislead the readers. The authors claim in the survival section of the paper that: "Vitreoretinal lymphoma is a life-threatening disease, with a 5-year survival rate of 71% in our study". Vitreoretinal lymphoma (VRL) may affect vision, and in very advanced cases that we rarely see in recent years, may destroy the eye. However, VRL per se is not what that kills the patients, but the associated brain lymphoma or in some case the systemic lymphoma. According to the results in this study (and the title of the paper), "Combined (local and systemic) treatment in patients with PVRL showed favorable results in comparison with local therapy alone (p=0.695). However, the statistical significance was not reached". It is no wonder that they claim that combined treatment is better than local treatment when they have 60% relapses. However, no other study of intra-vitreal (IVit) Methotrexate showed such a high relapse rate. In our experience, the relapse rate is extremely low with IVit methotrexate alone. Actually, in summarizing our ten years results we had no recurrence of the intraocular disease (2) and summarizing now our 20-year experience with 113 eyes, we had only two cases of recurrences (unpublished data). It is difficult to explain the poor results of the authors’ patients, using either intravitreal methotrexate alone or in combination with systemic high dose methotrexate. In their discussion, the authors write that "Vitreoretinal lymphomas are considered to be systemic disease….". It should be emphasized that this disease is in most cases a unique type of lymphoma that affects immune-privileged organs: the brain, the eye, and the testis, and only in some cases (17% in our experience), the eye disease accompanies systemic lymphoma. 2) Frenkel S, Hendler K, Siegal T, et al. Intravitreal methotrexate for treating vitreoretinal lymphoma: 10 years of experience. Br J Ophthalmol 2008;92:383-8.